Writer, blogger, history buff. I love all things food, wine and kid related. Find me at seeingthelighterside.com. 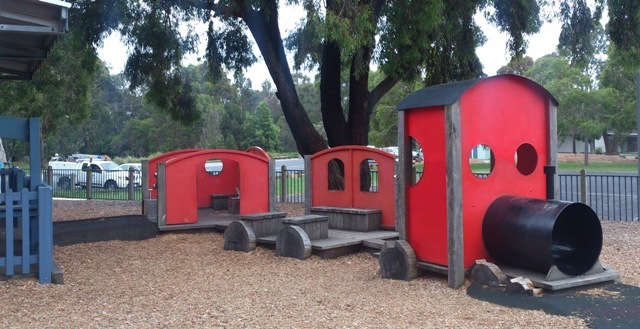 Bayswater Park Playground & Steam Train at the Marie Wallace Reserve is the place for train enthusiasts young and old to indulge their passion and imagination. 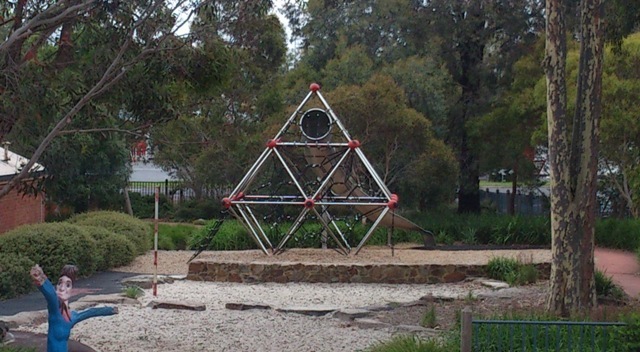 Tucked away from Mountain Highway just past Bayswater train station (easy walking distance), the Knox City Council-run playground is a popular place not only for the huge old steam train but also for the African animal-themed playground it nestles up to. In times gone by the steam train was a functioning engine riding the rails. Its retirement sees it appreciated by kids who love to climb up the stairs and into the cabin and play train drivers, and also model train enthusiasts who come to measure the engine's dimensions to ensure authenticity in their scale models. On the other side of the life-like station is a train for the mini-chuggers to enjoy, who might find getting up the steps into the engine a little daunting. 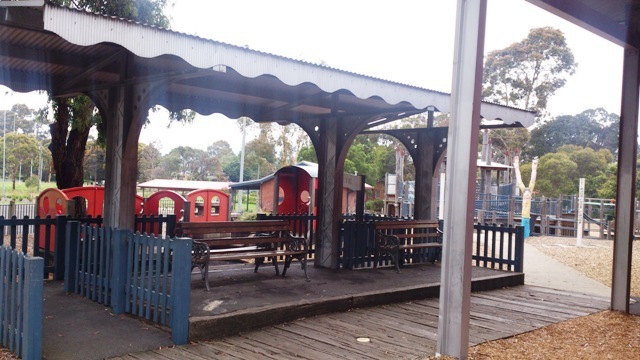 Once you've had your fill of the trains, head over the miniature level crossing to the playground proper. 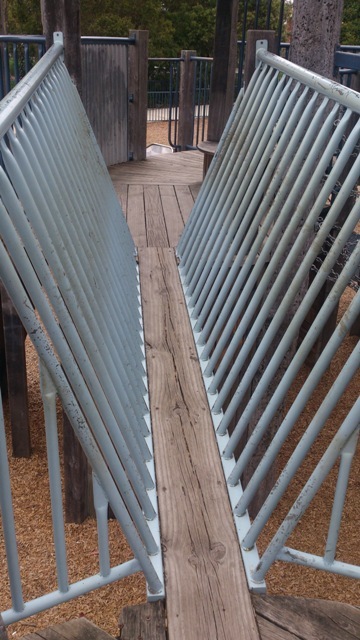 The raised boardwalks meander in a maze-like fashion, terminating in fireman poles, slides and requiring the adventurer to choose which bridge they are game to cross. 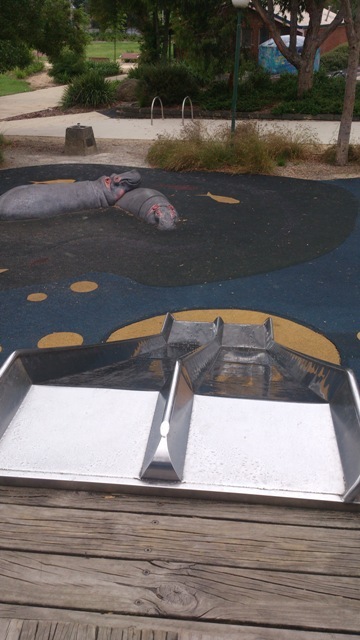 Dare to slide down the double slide into the waiting mouths of the hippos (they really are life-like). 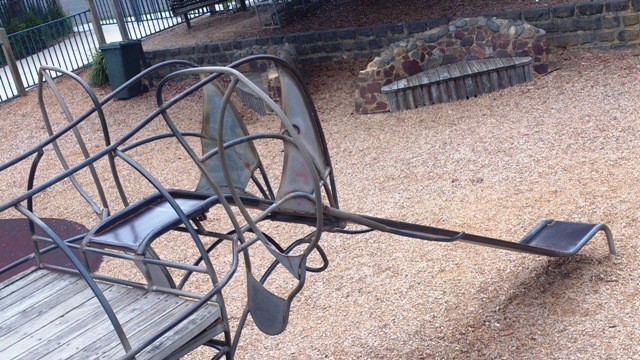 Or climb up the elephant and slide down her trunk. 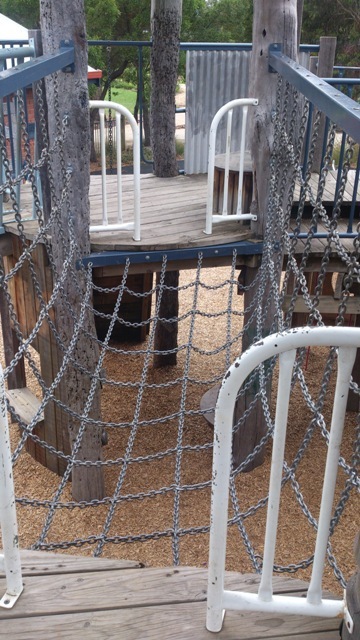 For the monkeys in the family there are rings, bars and flying foxes to be navigated. Off into the distance is a structure for the advanced climbers: not to be attempted by the faint hearted. Ample parking is available, turn off Mountain Highway at either King Street or Jim Abernethy Memorial Drive. It is also an easy 7 minute walk from the train station, or buses stop along Mountain Highway. Check the Public Transport Victoria website for more information. 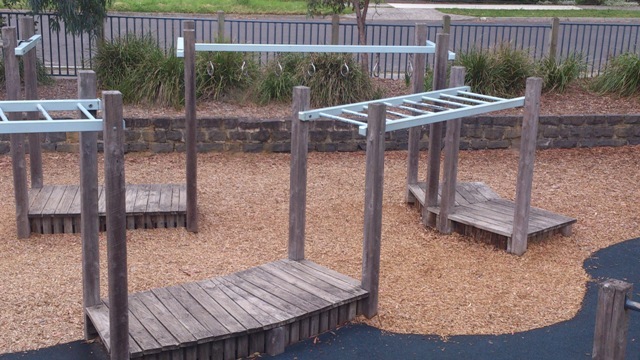 There are toilets just across the netball courts from the playground, as well as picnic tables and barbecues available for use. Why? 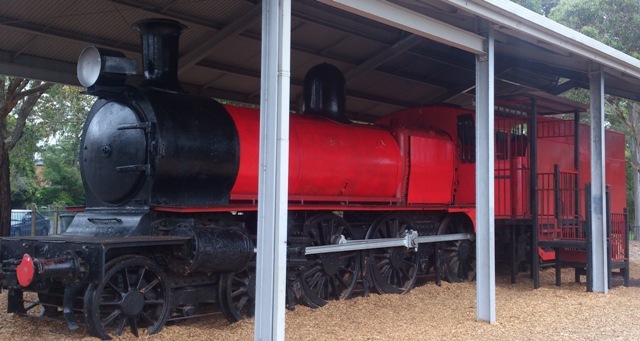 Because you can't go past a big red steam train!